2007 Adria Vini Barbera da Vine: Retail $15? This wine is perhaps the perfect pizza wine—nice and fruity but not overly complex, so your not worried that it is being drowned out by the “pie”. It is also rather inexpensive, so even if it were overpowered by the pepperoni, you would not really lose any sleep over it. Good. 84-86 Points. 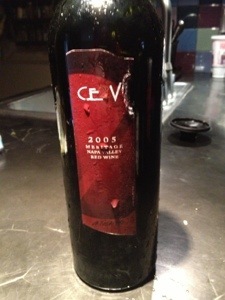 2005 Cosentino CE2V Meritage: Retail $100? A buddy from the PA Vine Co. brought this over and it did not disappoint. Amazing flavors and depth, with a finish that went on for what seemed like minutes. The complexity and fruit combo is something you are always looking for in a great wine and this certainly has it. In spades. Outstanding. 93-95 Points. 2005 Dutch Henry Winery Argos Hillside: Retail $40. We popped this to compare/contrast with the CE2V and while it certainly was a solid wine, it paled in comparison to the Cosentino. Still, good fruit and a nice finish, but slightly lacking in depth. Very Good. 87-89 Points. 2005 Grgich Hills Chardonnay: Retail $45. I got this a while ago and this was another wine that I feared that I might have held on to for too long. No need to worry, this has held up wonderfully. Pale yellow color of a wine half its age, the tropical fruit leapt out of the glass and danced on the tongue, with a tartness on the finish that accentuated the meal. Sure, there was some oak, but it was nicely integrated, exhibiting what California Chards can and should be. Outstanding. 90-92 Points. 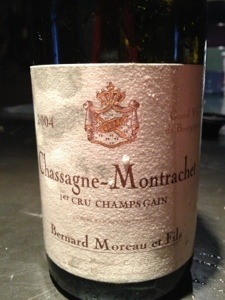 2004 Domaine Bernard Moreau & Fils Chassagne-Montrachet 1er Cru Les Champs-Gain: Retail $40. The comments and scores for this wine are all over the place on Cellar Tracker, ranging from 92 down to 75 (?!?). Now, I got this bottle from the PLCB and most of the comments seem to be from fellow Pennsylvanians, so there certainly might be some issues there (the PLCB is infamous for letting wine sit on a delivery truck for hours in 90 degree heat). Regardless, this might be the best Chardonnay that I have had all year. Clean and focused with a great nose and even better expression on the palate, this was fantastic. I am just giddy that I have another three bottles in the cellar. Outstanding 92-94 Points. 2005 Point Concepción Syrah Cuvée Jalama: Retail $18. I have mentioned this wine a few times here on this blog and I decided to crack another last night on our neighbor’s roof deck. This wine speaks to me on several different levels. The first, of course, is that the wine is fantastic–even eight years out, there is still rich fruit and incredible balance. Second, even though it begs to be consumed, I hold onto them with fierce determination to only pull a cork for the “right” moment. Third, the wine screams: “You’re an idiot!”since I had the opportunity to buy more (I got them from the PLCB for $11) and I didn’t. I choose to blame that last one on my wife, who keeps bringing up this foreign concept of a “wine budget”. Outstanding. 91-93 Points. 2001 Ridge Zinfandel California Essence Lytton Estate: Retail $35? After the end of a few bottles, I grabbed this from the cellar. Sweet without being unctuous and nice structure, but other than that, I was not really paying all that much attention. Still, Outstanding, but no point score awarded since I was pretty much gonzo at this point. 1980 Lequin Roussot Bâtard-Montrachet: See the full review HERE. 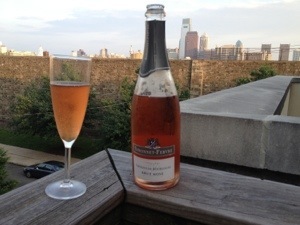 NV Simonnet-Febvre Crémant de Bourgogne Brut Rosé: Retail $18. My wife, at the end of a long weekend of work, when asked what she might like to drink, simply said: “Sparkling.” Many of you know that I do not need to be asked twice to open a bottle of the bubbles, so I ran to the basement and grabbed this. Great color–more red than pink, with gobs of red fruit to go around, made even better by drinking it out on the deck. Crisp and refreshing, I got a thumbs up from my over-worked wife. Very Good to Excellent. 88-90 Points. 2010 Spy Valley Pinot Gris: Retail $18? Much more than I expected. Rich and full, with really good fruit, acidity, and balance. This was much more like an Alsatian PG than an Italian Pinot Grigio (which is a very good thing). I would buy this again in a heartbeat. Very Good. 87-89 Points. 2007 Testarossa Pinot Noir Palazzio: Retail $30. I have had a few Testarossas in the past and I have always been pleased. This was no different. Jammy nose with a bit of stewed fruit (not a big fan of the stewed thing, but….). On the palate it is quite rich but lacks the finesse that I like in Pinot. Again, still Very Good, but not really my style. 86-88 Points. WINE OF THE WEEK: This week started off rather slowly, but as seems to be the case recently, picked up steam as we went along. The clear winner this week is the 2005 Cosentino CE2V (although the Chassagne gets honorable mention). I have been a big fan of Cosentino for a very long while–in fact it is the winery that I credit for nuturing my nascent infatuation with the vine about 20 years ago. I was a bit skeptical, however, when Mitch Cosentino decided to take on yet another series of wines when he started producing the CE2V line, fearing that he might lose a bit of focus producing so many varieties at so many price points. This wine is evidence that there was no need for concern. Bright and rich with impeccable balance, this was simply fantastic. Thanks to Jeff at PA Vine Co. for sharing! This entry was posted in Barbera, Chardonnay, Meritage, Pinot Gris, Pinot Noir, Sparkling Wine, Syrah, Wine, Zinfandel and tagged Mitch Cosentino. Bookmark the permalink. My wine of the week was 2004 d’Arry’s Original Shiraz Grenache – it was a beautiful wine. Yeah, the work is tough! I need to start exploring more Australian–you seem to really enjoy some of those wines…. I am always jealous of the amount of wine you sample in a week! I am still partially getting over being awfully sick a few weeks ago and I still haven’t gotten back into the swing of things in regards to tasting wine as frequently again yet for fear of feeling horrible the next day because of the combination of not feeling well and being hungover. Looks like you had a productive week! It never really starts out that way! We usually share a bottle a night, less on Monday and Tuesday. By the time the weekend approaches, we spontaneously have some friends over and the corks just start flying!